Getting vegetables into the bellies of my two boys can be a challenge. I don’t know if it’s the texture or the word itself, but they run at the sight of them. 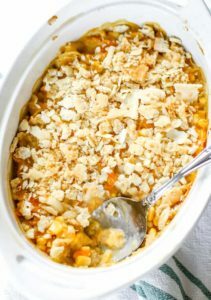 In an effort to try to be more creative, I wanted to share this cauliflower recipe! 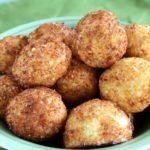 Cauliflower tots are awesome because they have a bit of the texture of regular tater tots and my boys love those. I was amazed at how these turned out! Crispy on the outside but packed with flavor. There was a few steps to the process, but overall they came together quickly. Cut the Cauliflower head in quarters and remove the leaves and thickest parts of the stems. Bring a pot of water to a boil and put the Cauliflower in and cook for 2 minutes. Remove and drain well. You don’t want to over boil, so set a timer. While still warm add the Cauliflower, 1⁄2 cup of Cheese, Butter, Cream, Salt and Pepper to a food processor and pulse until the Cauliflower is a fine dice texture, should look like the inside of a tater tot. Allow the mixture to cool to room temperature. Beat 2 eggs and add to the Cauliflower mix to combine. If it is not enough to get a good coating add additional eggs 1 at a time until well coated Add the remaining Cheese and combine. Refrigerate at least 20 minutes. 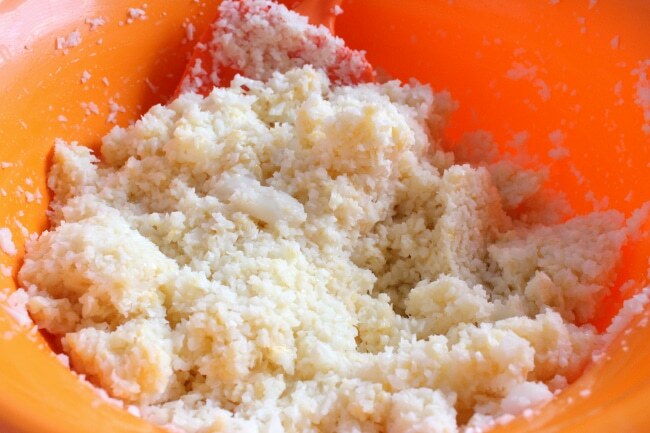 Remove from the refrigerator and add the Panko crumbs. 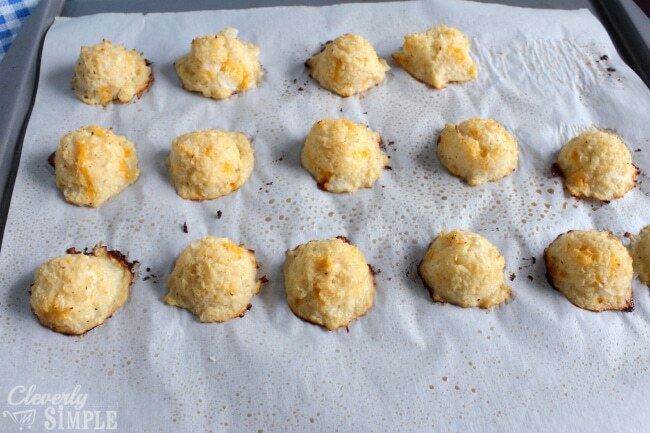 Using a tablespoon size cookie scoop get a packed scoop and form it into a ball and put on a tray or plate. Put in the freezer at least 20 minutes. Preheat oven to 400 ̊. Put tots on parchment lined baking sheet sprayed with cooking spray. Bake for 12 minutes and remove. Heat 1 1/2 to 2 inches of Oil over medium high heat to 350 ̊. Keep an eye on the temperature. A candy thermometer works great! 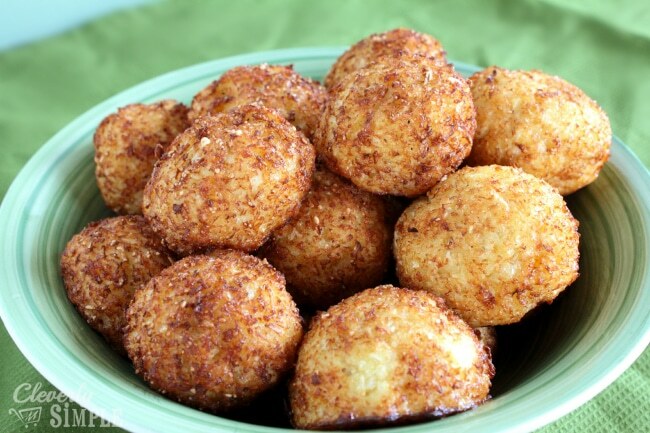 Working in batches deep fry the Cauliflower tots for 30-45 seconds until deep golden brown. Remove to a paper towel lined baking sheet. Serve hot and enjoy! 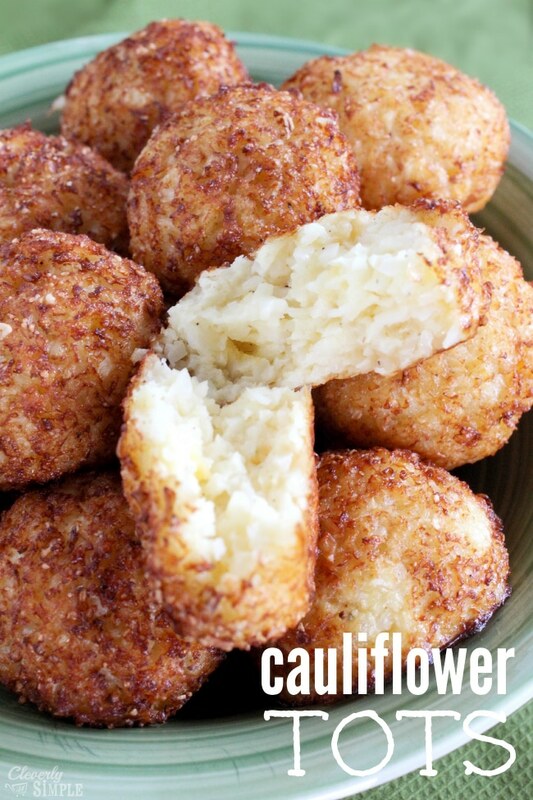 Tots made from cauliflower – delicious! Cut the Cauliflower head in quarters and remove the leaves and thickest parts of the stems. 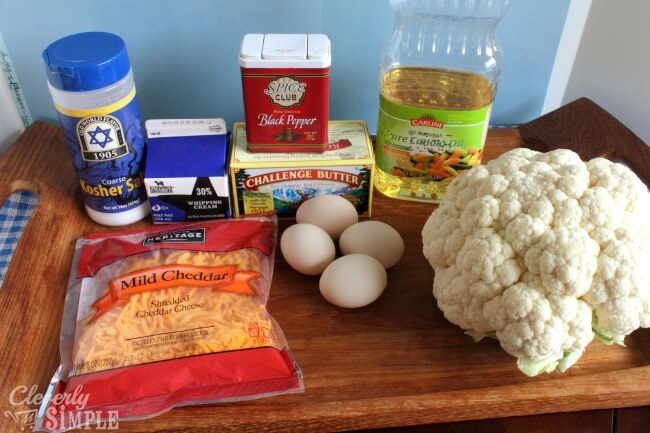 Bring a pot of water to a boil and put the Cauliflower in and cook for 2 minutes. Remove and drain well. Beat 2 Eggs and add to the Cauliflower mix to combine. If it is not enough to get a good coating add additional eggs 1 at a time until well coated. Add the remaining Cheese and combine. Refrigerate at least 20 minutes. Remove from the refrigerator and add the Panko crumbs. Using a tablespoon size cookie scoop get a packed scoop and form it into a ball and put on a tray or plate. Put in the freezer at least 20 minutes. Preheat oven to 400 Put tots on parchment lined baking sheet sprayed with cooking spray. Bake for 12 minutes and remove. Heat 11⁄2 – 2 inches of Oil over medium high heat to 350 ̊. Keep an eye on the temp. Working in batches deep fry the Cauliflower tots for 30-45 seconds until deep golden brown. Remove to a paper towel lined baking sheet.